Sharp World Clock comes with a sophisticated calendar widget for your desktop - a resizable month calendar, that can be freely placed anywhere you like. 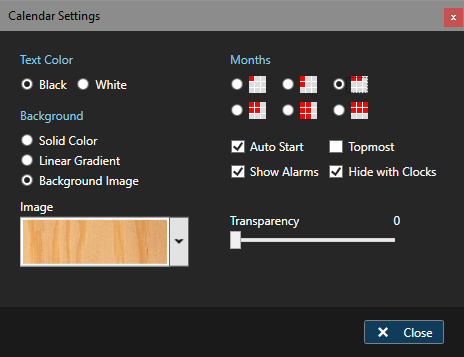 You can show 1, 2, 4 or even 6 months at once - with different layout schemes. Not only the size can be adjusted, but also the color (solid or linear gradient) and the transparency (0..90%). Along with the Alarm Center it is also a reminder for your appointments: you can make it show your alarms as a little triangle marker on the day of the alarm. Moving the mouse cursor over the calendar widget, you can see additional buttons to operate the calandar. Press the arrows left and right of a month label to switch one month forward or backward and the arrows next to the year label to switch one year forward or backward. Click at a month label to reset the calendar to the current month. Click the "..." label on the bottom left corner to open the settings dialog (or right-click to open the context menu and select Settings). The calendar widget can have a solid background, a linear color gradient and even a background image, as it is shown here. Background - Solid Color / Linear Gradient / Background Image - set the background color or background image of the calendar widget. Hint: try a linear gradient from some color to transparent! Transparency - set the calendar to semi-transparent. Check the option "Opaque on Mouse Over" to make it opaque when the mouse cursor hovers over it. If you have set alarms in the alarm center, those are shown with colored triangle markers in the days at the calendar: Those markers have the same color as selected for the alarm. Note: the "Edit Alarm" menu item only shows when there is one and only one single alarm for this date (again, recurring alarms and count-down-alarms are not considered). If this is the case, you can simply click the menu item for this day to edit or delete the scheduled alarm. The other two items are for adding a new alarm for the selected date and for showing the alarm list (the same as opening the alarm center dialog in default mode).